About a year ago, back in May 2012, I was asked to oversee the design, construction and move activity for Roundarch Isobar?s Boston office location.? We have now been settled into this new South Station office for approximately three months and lately I have been reflecting on the vision and objectives we had for the space and the year of hard, but rewarding, work many put into making the space what it is today.? We had very specific objectives for the office and its use by our staff and as I look around the place today I can say with confidence that we exceeded those objectives. 1)???? Design a space that fosters (or even demands) collaboration and takes advantage of the entirety of our 35,000 square feet of space to do so. 2)???? Bring together, for the first time in one location, the combined Roundarch and Isobar organizations to truly become one entity. 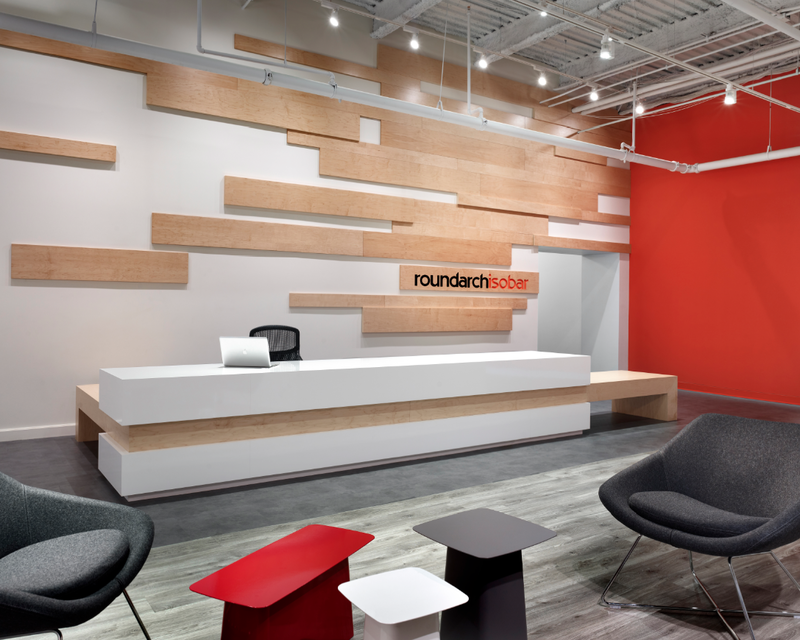 Overall, however, our simple goals were to deliver a space where people were excited to come to work, where clients were excited to visit and ultimately to provide an environment enabling Roundarch Isobar to continue to bring people and brands together like never before. We embraced an open floor plan with no cubicles!? We also integrated our disciplines within the seating areas vs. putting all staff alongside only those from their specific disciplines.? Why? This allows for continuous exposure to the full offering and capabilities of the company by all staff and breaks down the discipline silos. There are also a limited number of closed offices and a plethora of conference rooms, all outfitted with large screen wall mounted displays. ?Many of these rooms are leveraged as dedicated war rooms for large client project teams. The showpiece of the space is our nearly 300 person capacity central event space with a view of the Rose Kennedy Greenway, Dewey Square and the Financial District.? The room is outfitted with a 14 foot screen and full audio visual capabilities to support company-wide presentations.? This space also houses our fully stocked kitchen!? The room serves as a location for the entire staff to gather for company meetings, guest speaker events, discipline workshops, after hours social events and throughout the day is simply a comfortable location for meeting and collaborating with colleagues.? The room is a hub of constant activity throughout each day. Throughout the space are several common areas outfitted with writable surfaces, tack board and magnetic wall surfaces for displaying and organizing work.? There are an abundance of soft seating areas with tables for informal meetings or to take advantage of time away from your desk with colleagues.? There are also quiet rooms for nursing mothers and phone booths for added privacy. 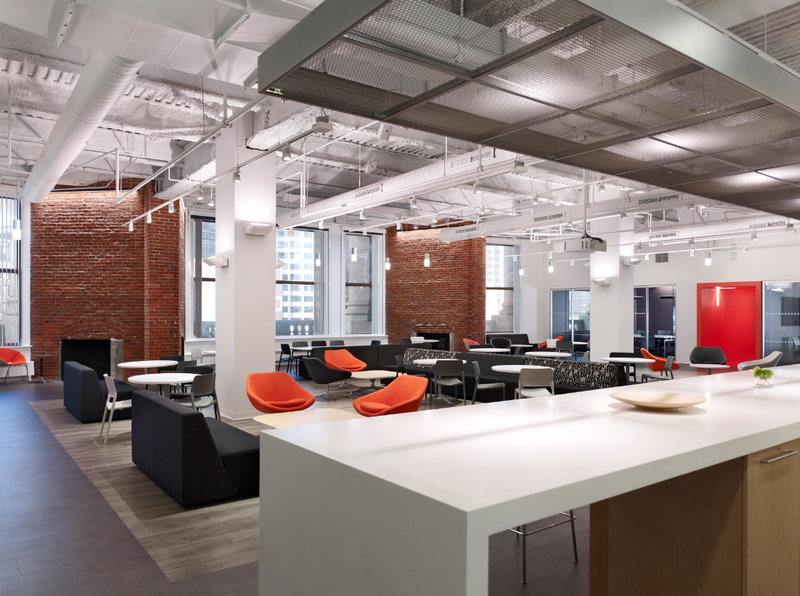 Ultimately the space was designed around our people and the innovative work we do every day for our clients. ?Words alone do not give justice to the space so please view the photo gallery.